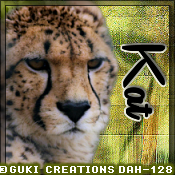 I am using the awesome tube, called Leopard Looking by Guki Creations. Animals of the wild are so beautiful, you will tagging with this tube. Signature tag size 600 x 250 or a size you prefer. Paste paper 2, merge visible. Go to Effects, Edge effect, enhance twice. Paste your tube, mirror, change the blend mode to overlay, sharpen once. Paste the house below the tree layer on the left and move to the left behind the tube. Merge visible, then apply the AAA Frame-Foto Frame, twice with these settings. Open a new image 175 x 175 or a size you prefer or your group or forum allows. apply the AAA Frame-Foto Frame with the same settings from before. Once happy with the signature tag and the Avator, add your copyright and name. Please do not alter in anyway, or add names to them.